Sunday Summary – Posts to Look at! I hope you didn’t miss the 50k Lufthansa Miles & More Offer which should have already ended which as of 2am Pacific still seems to show the 50k offer. Now you can redeem your avios for up to five people who do not share your address by adding their name in the new Friends & Family List. Previously with household accounts you could only redeem for members who were in your account and thus had to share the same address. I’ve actually had a household accounts since separately the balance of the accounts I control have had more than enough points for the short-haul redemptions that nearly my Avios redemptions have nearly all been. The fact that I couldn’t redeem for friends and/or relatives who didn’t share my address was a big deal breaker for me in making a household account, but now this isn’t such a problem. Kudos to Avios for actually implementing something beneficial for us which shouldn’t cost them that much! There is a FAQ available online here from Avios. United has already removed Singapore Airline award availability from their website. They said that it was a mutual decision, but I’m guessing here that it was most likely done by United to prevent non-miles/points savvy members from booking this space as space still shows on the ANA tool and Aeroplan.com which is the best alternative to searching for Star Alliance space. As I’ve already mentioned, it seems that along with this change SQ has also pulled all business class space to Australia and New Zealand more than 14 days before departure as I mentioned in this post, which is extremely frustrating and quite sneaky. 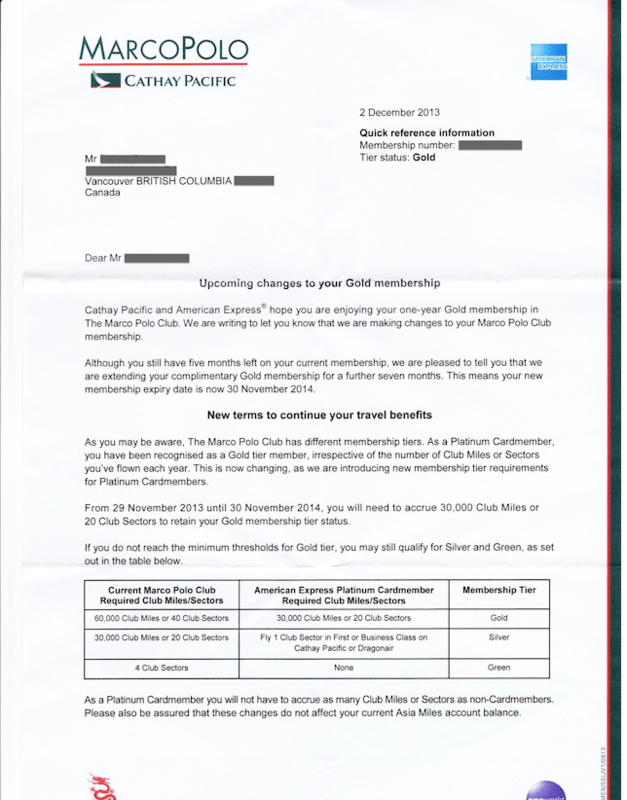 Canadian Platinum Cardholders losing Cathay Pacific Gold Status? This is a HUGE blow to the benefits of the Platinum Card, which when coming with a $699 annual fee, is really high. Totally awful news for Canadian AMEX Plat cardholders. If you don’t currently have the card and want to get it and see if you can status match to anyone, there is a 60k refer-a-friend offer which is somewhere on my right column of links, under Canadian Credit Cards (no link here because I try not to put credit card links in posts). This is the best offer that I know of and I get some points if you use my link. Thanks for your support.